The Book "Piano Exercises" with added DVD is available. 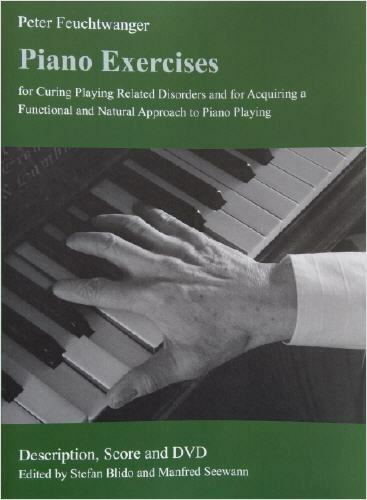 The book "Pianoexercises for curing playing-related disorders in pianists as well as for learning a functionally natural behaviour in piano playing" has appeared in March 2004 only in German language together with a matching DVD in english language. Since 2018 the english edition of the book with the translation from William Cuthbertson is available. On the video you will see a lecture from Peter Feuchtwanger about the genesis of his Piano Exercises. Afterwards Peter Feuchtwanger explains each of his eighteen basic piano exercises and Frederik Malmqvist demonstrates the exercises completely, some of them even with reversals. In the end of the video some exemplary fingerings and their technical execution will be shown. Beside this Frederik Malmqvist plays a composition from Peter Feuchtwanger. The techniques which could have been learned by the Piano Excercises is demonstrated in practice. The duration time of the video is 64 minutes. The video was produced by Stuart Monroe (London) and is completely in English. The book with DVD can be purchased in unity only. The price is 65,- € + costs of shipment, this is 10 € worldwide. The book with many unpublished photos has the format DIN A4, is ligated with rings in paperboard hardcover and enbraces 122 pages. The foreword to the book wrote Professor Günter Reinhold. Stefan Blido wrote a short essay over the piano exercises for the anniversary publication for the 20-year old anniversary of the master course in Feuchtwangen. The Second Exercise "Change of Position" in pdf-Format. Carsten Dürer wrote in the magazine PianoNews a critik under the "Einleuchtende Lehre" - only german version available. Katharina Lorenz wrote in the NMZ a review of the piano exercises - only german version available. Reinhold Schmidt wrote a review in Üben & Musiziereen -only german version available. Nancy Lee Harper published a critic in Piano. Achim Clemens about the piano exercises. In the essay Zen in the art of playing the piano, Stefan Blido explores the philosophical implications of piano exercises, of course with reference to the famous work of Eugen Herriegel, which Peter Feuchtwanger likes to name. You can order Book with DVD by using our Formular. If you have questions or if you want to contact us, use the field "Your Message". If your browser does not supply the formular, please send an Email to: stefan@blido.de. Mrs. / Mr. / Dr. / Prof.